Yoghurt pots under the bed. This was a well known phrase amongst the students of Hitchin Girls’ School where I spent my younger years. To be honest, I can’t completely remember what the point of the story was but I *think* it was to do with the Head Mistress’s teenage son who used to leave empty yoghurt pots under his bed because he was too lazy to throw them away. It was her way of telling us to be helpful to parents and make an effort over the summer holiday. Anyway, having been sent selection of yoghurts by The Collective Dairy, and in particular a couple of pots of their new “Straight Up” unsweetened culinary yoghurt, I think that I may be in danger of being a yoghurt pot hoarder. I should note for the record though that my yoghurt pots will be washed and being re-used for packed lunches rather than festering under the bed. 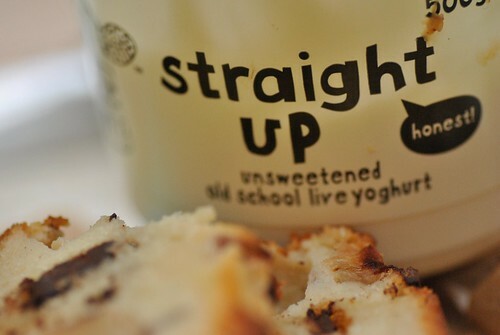 My first taste of Straight Up was a sneaky spoonful after a day of baking sweet things. Somehow the pot then became empty. I’m not sure how that happened but it seems that the creamy but tart and ever so slightly cheesy flavour is the perfect antidote to baker’s tastebud fatigue. Until now I have always used marmite or peanut butter on toast to treat this particular ailment. One of my favourite cake recipes is the BBC Good Food Vanilla Cake which they recommend for making wedding cakes. It’s got a good dense texture which is good for icing and stacking but still feels really light. It gives consistent results and contains yoghurt, which I think must be what keeps it from being too sweet. 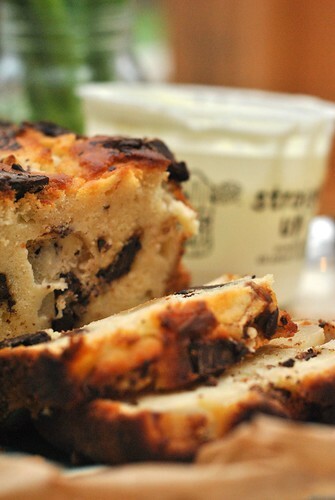 This recipe for chocolate and pear cake is similar and is really good eaten warm with custard. It also freezes nicely. I used fresh pears but only because I had some in. 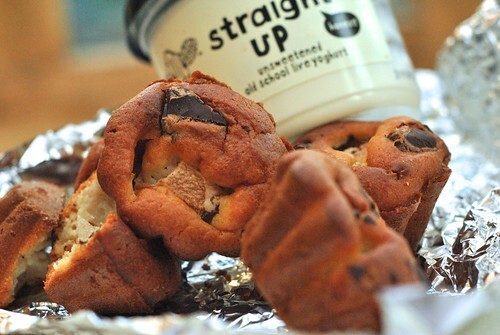 Other “straight up” recipe suggestions can be found here. I particularly like the sound of the honey and yoghurt bavarois. 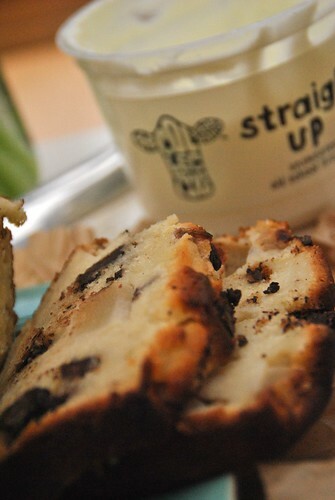 Collective Dairy suggest: Any left over cake lasts 2-3 days and can be toasted and served with butter and apricot jam. Butter and line a 2 lb loaf tin (24cm x 12 cm x 7cm). In a large mixing bowl, whisk the Straight Up yoghurt, eggs and sugar together until smooth. whisking all the time, until you have a smooth silky batter. Pour over the remaining cake batter. chopped pear and chocolate and push them down lightly into the cake mixture. Bake on the bottom shelf for 45-50mins or until a skewer comes out clean. If the top looks like it’s darkening too much (check it after 30-40 mins) cover the cake with foil. out on a wire rack. Thanks to Collective Dairy for the samples of Straight Up yoghurt as well as Blood Orange, Russian Fudge, Coffee, Mango, Lemon and Passion Fruit ones and some of their little squeezy pouches. I was not required to write a positive review and had only agreed to write a couple of lines giving my honest thoughts so this is most definitely an honest post! I love using yoghurt in cakes as it keeps them so moist and I’m sure the pear helps too. It sounds a really delicious cake and the different yoghurt flavours sound interesting too – I’d love to try a coffee one in the morning!